At least 2-nights wellness stay with half board, children’s and sports animation activities every day. Spring wellness stay with half board with an extra pasta lunch, children’s and sports animation activities every day. 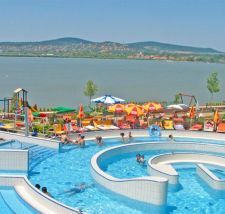 At least 3-nights summer holiday with half board, children’s and sports animation activities every day. Have you been to our hotel already? If not, spend a minute and a half to see this video, and picture yourself on the beach of Lake Velence. Enjoy our services and free-time activities, the all-you-can-eat dinner... You will surely want to come. Feel free to use our price calculator without obligations. Our website offers the best price for your holiday. Booking is easy, it takes only a minute and you will receive an immediate confirmation. We have set up separate play centres for children, appropriate for different age groups. Child care is available seven days a week for children above 3, giving the parents some time off. You will find a baby and children’s pool in the adventure bath and we have laid out a separate children’s buffet at dinner. The kids may meet our two mascots, Ele-Philip and Ele-Fanny the two little elephants every day. A beauty parlour and wellness treatments await the young ladies and gents. Our hotel and adventure bath offer a variety of wellness and massage vouchers and entry tickets: the perfect gift for your beloved, co-workers or business partners. Choose from our services or package deals, or let us make your ideas come true. Why not surprise your friends with an entry ticket or a pampering massage? The voucher will be made out with the recipient’s name and a personal message upon request. From March 2019 our hotel guests can collect their beach towels and sauna towels from SPA reception. Attention Daddies and Mummies! Your little princesses between 2-12 are welcome to get beauty treatments at Ele-Fanny’s beauty parlour on the first floor of the spa.